Peel and cut the apples into cubes and the prunes into four parts. Put the fruit in a bowl, add sugar, cinnamon, cloves and season with lemon juice. Separately add butter, sugar, minced almonds and a pinch of salt to the flour. Quickly knead the ingredients with your hands until you obtain a thick, clumpy dough. Butter a baking tray, dust it with a little breadcrumbs mixed with flour, spread the fruit on the bottom and finally cover with the crumbled pastry. Bake at 200°C for about 20 minutes, until the surface gets a golden colour. Serve together with yoghurt ice cream. Ideal at the end of a meal as a dessert, on its own as a mid-afternoon snack or at breakfast with a cup of tea/coffee. Castello del Poggio Moscato d’Asti DOCG or Moscato Provincia di Pavia. If you are planning on baking a cake to eat at breakfast or to offer to your friends coming over for dinner, you might want to try out this apple and prune crumble! 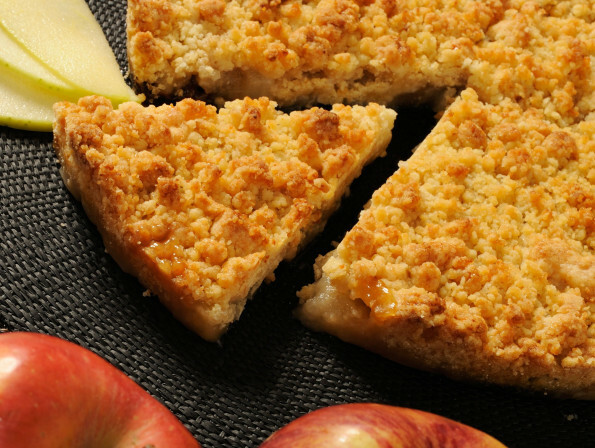 Very easy to make, with a few high quality ingredients, its outstanding taste and texture will seduce you: the soft sweetness of the fruit and the crunchiness of the almonds in the crumble dough create a unique, balanced combination that your taste buds will appreciate!